Hailing from New Zealand but being very much the worldly traveler, Hollie Fullbrook played a short set of her folk hued tunes under her Tiny Ruins moniker. Fullbrook must being getting used to playing criminally short sets at this venue when in Perth, but her voice alone would have won her many new friends and fans. Melbourne’s Quarry Mountain Dead Rats bring a dose of bearded cool to their high octane brand of bluegrass. The five piece were finger pickin’ up a storm from their album, Bloodhound Killed My Squeezebox, with some rock and roll vigour to these rustic tunes. They may not be doing anything that hasn’t been seen before, but they did liven up the early evenings proceedings. Jairo Zavala has featured on Calexico albums in the past without being seen as a fully fledged member of the band. Tonight he would first appear as DePedro, playing his solo material that is heavily steeped in Spanish and Mediterranean timbre as well as Latin folk. Zavala was joined on stage by various members of Calexico throughout and proved to be an adept and charismatic front-man even when flanked by such esteemed company. 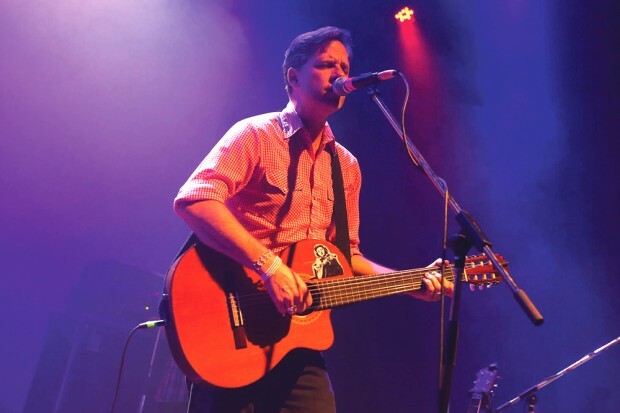 Calexico, who have made the genre of ‘desert noir’ their own, launched straight into things on a high note. Latest album Algiers was always going to be well represented, but it was Across The Wire that saw the band deliver their dustbowl cool to knowing nods. The band’s pop sensibilities spilled over with the harmony drenched Splitter, which gave the strongest airing of the dual trumpets of Jacob Valenzuela and Martin Wenk. Things became a bit more somber with Dead Moon, and the smiling Valenzuela showed his star quality for Inspiración. John Convertino oozes cool from behind his wide rimmed glasses as he effortlessly drives the rhythm section. There are few drummers with the poise and skill of Convertino, who never appears to break a sweat. The band pulled members off stage to play a restrained version of Fortune Teller that was the finest point of the evening. Hollie Fullbrook returned to the stage to show her versatility in assisting Burns to sing Slowness. Having the crowd eating out of his hand during the DePedro set appeared to inspire Zavala, who was every bit the showman as he took lead guitar duties for the full Calexico set. When not giving the fretboard a solid workout, he was whooping and throwing his hands in the air, a great foil for the more introverted Burns. Being better aligned with Spaghetti Westerns and conjuring images of Breaking Bad or The Bridge didn’t stop Calexico from dabbling in some well placed covers. Love Will Tear Us Apart was entertaining if somewhat indulgent, but they ripped through Love’s Alone Again Or as if it were their own plaything. Calexico are indeed in a class of their own.